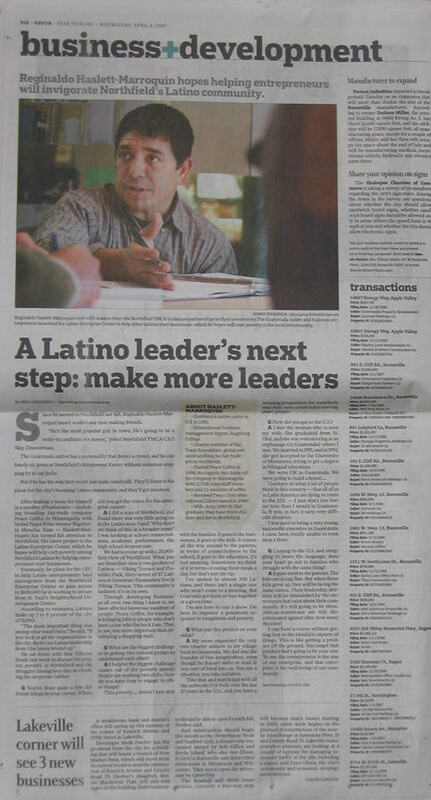 Yesterday’s StarTribune South section carried this full page story titled: A Latino leader’s next step: make more leaders Reginaldo Haslett-Marroquin hopes helping entrepreneurs will invigorate Northfield’s Latino community. And I thought I was a media maggot. Regi, you win, hands down! Q What are the biggest challenges to getting two cultural groups to understand each other? A I believe the biggest challenge comes out of the poverty aspect. People are working two shifts. How do you have time to engage in other things? This poverty … doesn’t just stop with the families. It goes to the businesses, it goes to the kids, it comes all the way around to the parents, in terms of connectedness to the school, it goes to the education. It’s just amazing. Sometimes we think of it in terms of eating three meals a day, but that’s just the tip. I’ve spoken to almost 200 Latinos, and there isn’t a single one who won’t come to a meeting. But I can only get three or four together at a given time. I’m not here to run a show. I’m here to organize a grassroots response to integration and poverty. Thanks for the follow-up comments. I just returned from a trip to Iowa and Texas, IA for more work with Latinos and TX for the national congress of Latino Farmers and Ranchers. Very interesting. On the trip from IA to TX I traveled with a friend from Marshalltown. Guess what.? He is related to our own bandido robabancos, Jesse James. He told me he has proof of it. Anyway, I have a picture with him in Texas, if you want to do a blog on it on your site, it would be more fitting than doing something on mine. Maybe I can just post it on your site, I started a draft at the latino enterprise site, but it is all over the place for now. Cool! A relative of “Bandido robabancos, Jesse James” should pay us a visit during DJJD. But I think you should blog it, Regi, and then I’ll link to it. This was a great article – I hope it helps marshall some interest in the LEC and what Reginaldo’s trying to do here.